Do you know your putter's sweet spot? Did you even know your putter has a sweet spot? I never really thought about it. I guess I assumed it was indicated by the guide line on the putter. Well, it seems that it is and it isn't... If it's a good quality putter, with a balanced head, yes, otherwise, no. How do you know if your putter is up to snuff? Find the sweet spot. See where it's located in relation to the putter's guide. 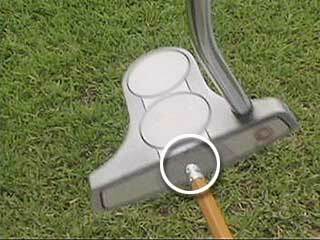 As you tap near the toe and heel you will see the putter head oscillate wildly. Now slowly move in toward the middle of the putter head, bouncing the pencil eraser off the face. Notice a difference? At some point you will see the putter bounce straight back, zero oscillation. You've hit the sweet spot. Continue toward the back. As you work your way further from the sweet spot the putter head begins to oscillate again. Work your way back to the sweet spot, zero oscillation. If the sweet spot differs from your putter's guide, mark it with a permanent marker. This is where you want to strike the ball for optimum putting. I was ecstatic to find that my putter's guide line and sweet spot were in perfect sync. They should be, but you never know. This is very simple to do, and can be of great assistance when choosing your next putter. Enjoy these products knowing that you are purchasing from the largest PUTTER store in the world.